We are joining with Student Venture to start the Easter weekend with their 33rd Annual Good Friday Crosswalk on Friday, April 19th. We will gather at 11am in the Temeku Cinema’s parking lot for prayer, then walk 2.2 miles to Sam Hicks Park in Old Town Temecula, which will be followed by a Praise and Worship celebration! This is a great way for everyone to start the Easter weekend celebration, and this event is an amazing opportunity to show the community that Jesus Christ is alive and well! Note: Drop your lawn chairs, blankets, and ice chests at Sam Hicks Park before the walk. Shuttles will be available after the walk to return drivers to Temeku Cinema’s parking lot. Be sure to check out Cast A Shadow’s latest newsletter. We said let’s get these kids trying something different. Teaching them to climb over problems doesn’t just mean boulder problems…but teaching them that problems in life can be climbed also. For more information on Cast A Shadow, or any of Impact’s Missions, click on the links below. We are planning a Mission Trip to Cambodia in Fall 2019. Join us at this informational meeting to learn more about Cambodia, what ministry opportunities are available there, the costs associated with the trip, and the tentative dates. We will also have a question and answer time. We hope that you will be able to join us for this meeting on Sunday, January 20th at 9:30am (during 2nd service) in Suite D (MTA Offices). We'd like to have an idea of how many plan to attend this meeting so we created a "Registration Page" online. It would be helpful to us for you to sign-up. Please share this news with anyone else that would like to attend this informational meeting. During Ted Lawler’s last update a couple of months ago, he presented the need for chairs for Breath of Heaven’s new church facility in Zambia. Impact responded and they were able to purchase the needed chairs! Breath of Heaven Children’s Ministries (“BOH”) is one of the Missionary Organizations that Impact Church supports. Remember to keep Ted and the entire BOH team in your prayers. And they welcome and appreciate any messages or posts of greetings and encouragement. The rain has cleared out, and we are good to go! Bundle the kids up, decorate those bikes with lights, and come on out to Wheatfield park tonight! Kids learning to speak Christ into others by giving. Decorate your bike and decorate a life. Have our kids raise enough to buy one bike for Zambian kids. Have each of your kids go out there and raise at least $10…do chores, take out the trash, rake leaves, vacuum, clean dishes…do whatever it takes to teach them to raise $10 so they may learn the joy of giving. Start getting those bikes covered in Christmas lights. The Christmas Light Bike Parade will be at Wheatfield Park on December 7th. We are planning 2 Mission Trips to Cambodia in the next 15 months. 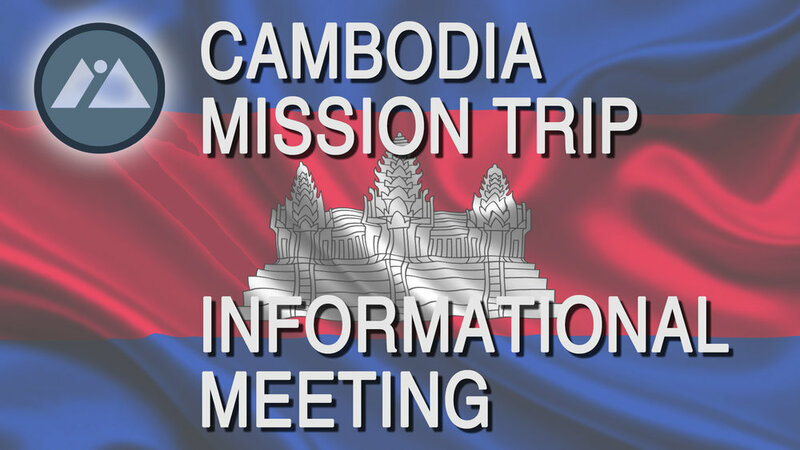 Join us at this informational meeting to learn more about Cambodia, what ministry opportunities are available there, costs associated with the trips, and the tentative dates. We will also have a question and answer time. We hope that you will be able to join us for this meeting on Sunday, July 22nd at 11am (during 3rd service) in the Impact Church Offices. 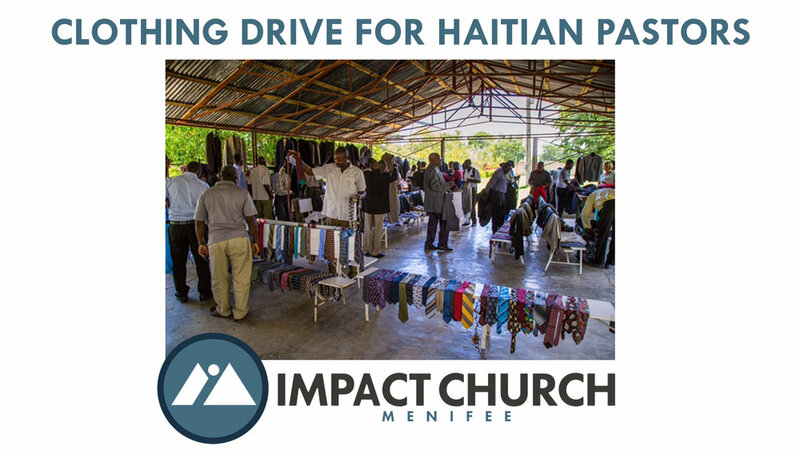 We are partnering with Haiti Endowment Fund to collect men’s dress clothing for local pastors in Haiti. If you’d like to help, please bring clean and gently-used men's suits, ties, dress pants and dress shirts to any of our worship services on Sunday, April 22nd. Donations will also be accepted at the office during the week Monday through Thursday from 9am to 2pm. Please note: There is no need for shoes at this time. Over the next two weeks, we will be partnering with Haiti Endowment Fund to collect men’s dress clothing for local pastors in Haiti. If you’d like to help, please bring clean and gently-used men's suits, ties, dress pants and dress shirts to any of our worship services on April 15th or 22nd. Donations will also be accepted at the office during the week. We are joining with Student Venture to start the Easter weekend with their 32nd Annual Good Friday Crosswalk on Friday, March 30th. We will meet at 11am at the Temeku Theater parking lot, walk to Sam Hicks Park in Old Town Temecula, and spend about an hour worshiping with a local worship band and hearing a short Easter message! This event is such an amazing way to show the community that Jesus Christ is alive and well! This is such a great way for everyone to start the Easter weekend celebration and we would be so blessed if you would join us this year! Cast a Shadow hosted an Adaptive BIke Race at Donald Graham Elementary School in WIldomar. Be sure to read the newsletter and watch the video. Team Cast a Shadow is such a blessing! Be sure to read Cast a Shadow's Newsletter "Forward" to find out what some kids were able to provide for other kids. Cast a Shadow uses the vehicle of modern cycling to cultivate an unparalleled riding community. It empowers riders to seek and become the best possible version of themselves. As riding bikes and self improvement via community are a priceless thing the end goal is to leave lives changed and enriched. This is where Cast a Shadow's hand of hope encourages the passion of Ride With Purpose. As an organization we partner with a variety of unprivileged groups and non profit organizations to provide bikes to inner city kids, water wells to third world countries, and covering medical expenses and other hardships experienced by members of the community at large that may have otherwise gone unmet.